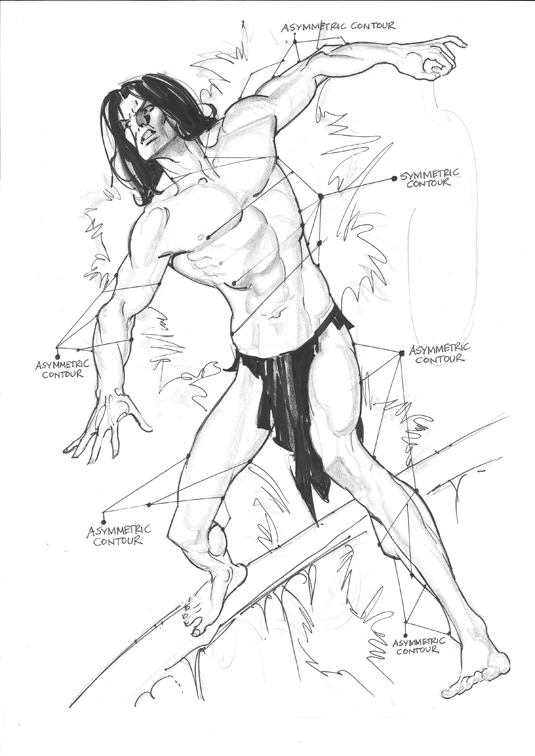 10 steps to improve your figure drawing – Artist John Watkiss breaks down compositional and anatomical techniques to accurately illustrate the classic fantasy character Tarzan. The two key words in the field of art illustration are principles and technique. Principles involve sub-titles such as composition, structure and expression, while the means by which these three sub-titles are presented are by technique. Technique is the use of any physical media, but note that oil, watercolour, pencil, pen, Photoshop and so on are ineffective if the first three principle sub-titles aren’t understood. This workshop will demonstrate both aspects in harmony. Many people fall foul of technique workshops and very often neglect composition. Technique has a lot in common with effect – and effects can sometimes blind us to the cause of things. Knowing what causes light and shadow – beautiful contour shapes, strong visual impact – makes our work stand out. Here, I’ll encourage you to develop an all-round approach to drawing, which will aid in greater confidence in expressive vision. I’ll finish things off with the issue of technique. Technique is the language and principles are the thoughts. Thoughts without language are useless. I’ll demonstrate the art of rendering with pen and pencil, showing the media that I’ve used. I developed this technique over many years of working in the film world, trying to find the most powerful way to express myself with traditional media. Let’s get the show on the road – and remember to have fun! Although this article is an exposition on Tarzan’s anatomy and illustrated completion, my first instinct is to talk about composition. This is the important stage of the figurative procedure. 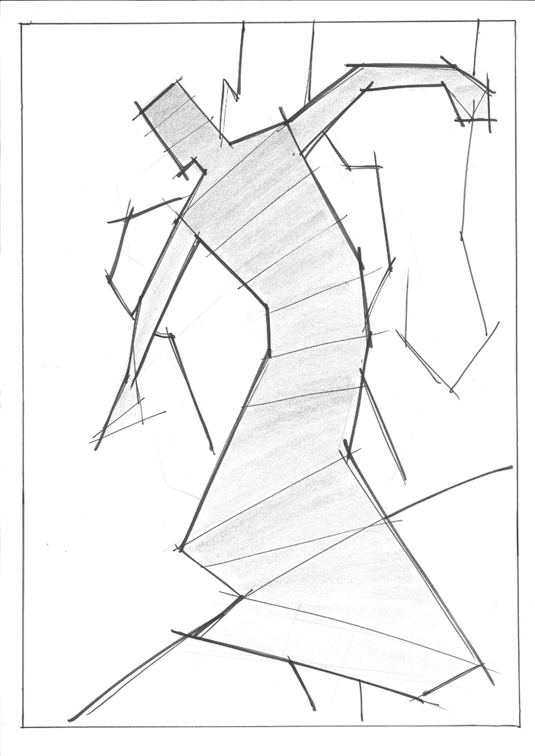 I start with straight lines to create a powerful silhouette of Tarzan in action impacting the picture plane. 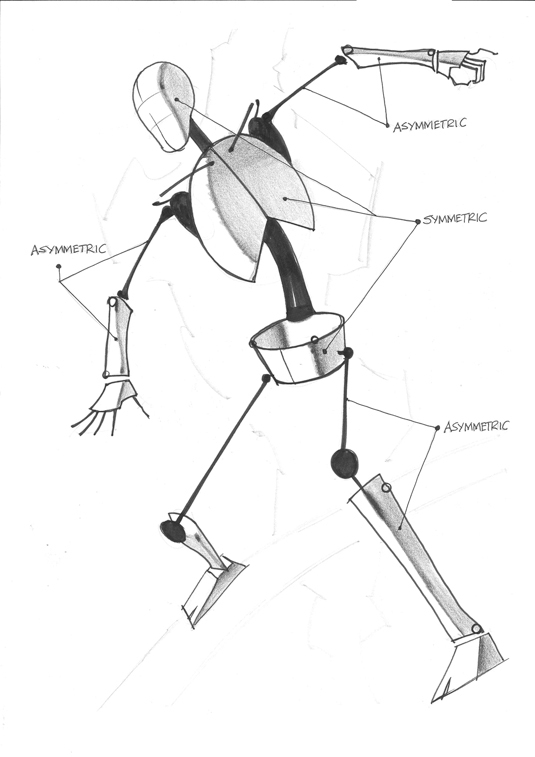 This is the groundwork for dynamic anatomical placement. The skeletal realisation is the next consideration. Here I’ve simplified the bone groupings: the black line gestures symbolise only one bone count. The elongated rectangular elements symbolise only one bone count. The elongated rectangular elements symbolise a two-bone grouping. The arms, legs, feet and hands are asymmetrical, whereas the skull, rib cage and pelvis are symmetrical. The previous construction has paved the way for this literal rendition. The important factor is to compare the asymmetric with the symmetric bones. I’ve labelled the most important bones in this diagram. You’ll see later why the understanding of asymmetry and symmetrical play an important part in realising our anatomical Tarzan. 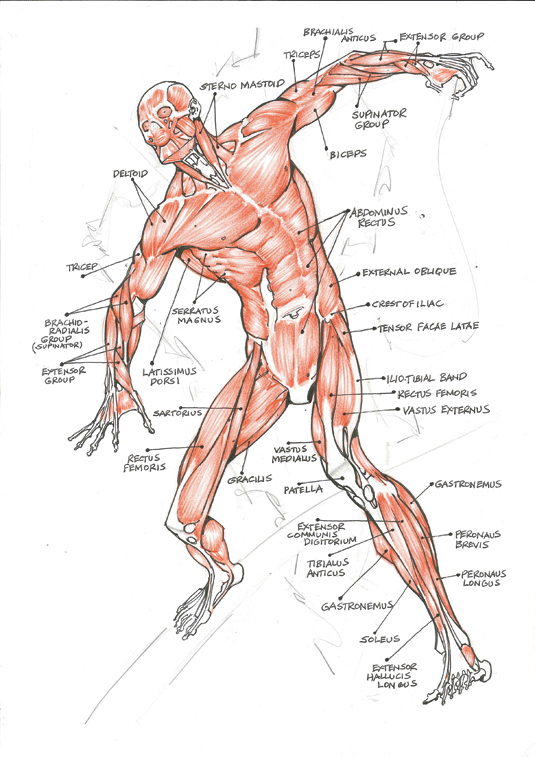 Once again I’m starting with the general groupings of the muscles with an idea of realising the detailed aspect. Notice the tumbling asymmetry of the muscles that run along the asymmetric bone beneath. Note also the solid symmetric muscles that lie upon the symmetric bone mass, and how this affects the contour of the figure. From the general to the particular is a compositional principle. 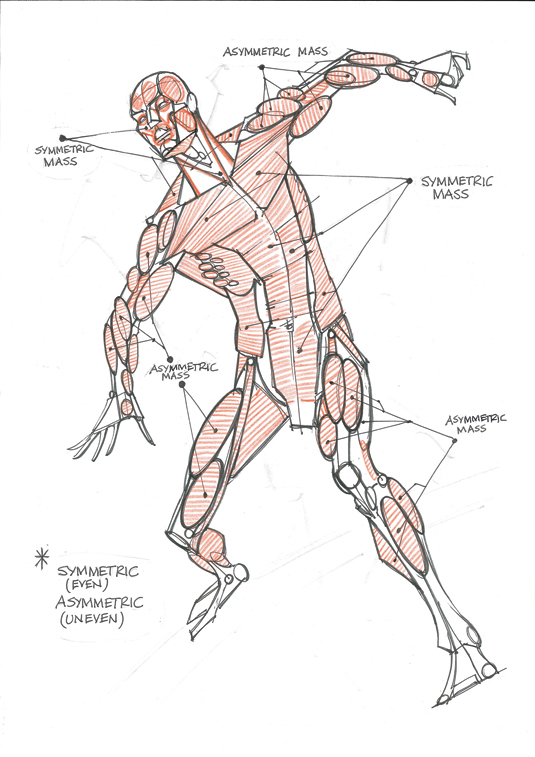 The muscles have their own compositional dynamic. Here, I’ve labelled the most important muscle groupings. The Latin names may seem a bit exotic, but I would point out that remembering their unique shapes is more important that their Latin names. Now try and relate the previous diagram with the outline contours of this Tarzan rendition. Take your time and appreciate the asymmetrical and symmetric forms. I’d like to point out a certain phrase of observation called looking for “counter curves”. Notice that because of the asymmetric arrangement of the muscles from the top of both arms to the wrist, how the curves are different on both sides. This also applies to the legs. I emphasise this because in my life-drawing/anatomy instruction experience, people have a tendency to draw the arms and legs symmetrical, with the curves being equal on both sides. 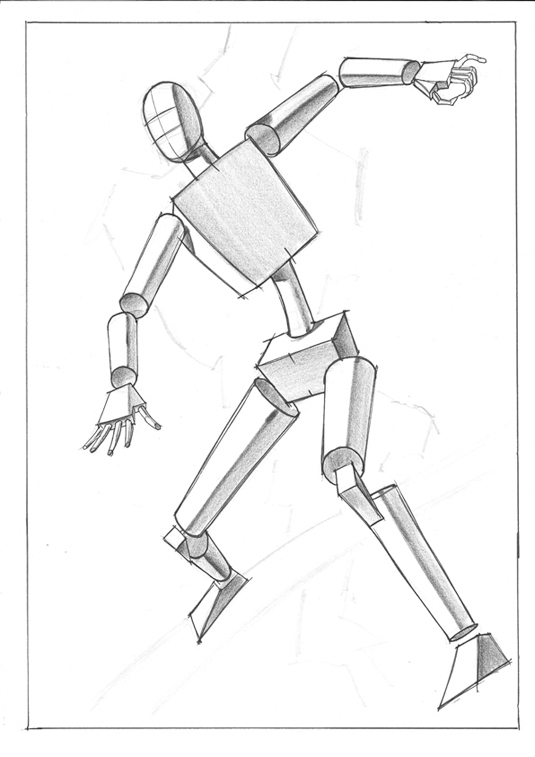 In preparation for the light and shade illustration of Tarzan, this geometric construction aspect gives an example of three-dimensional action that’s possible with the character. So far we’ve considered the contour-linear features. Compare this diagram with the one in step 2 (Skeletal synthesis). 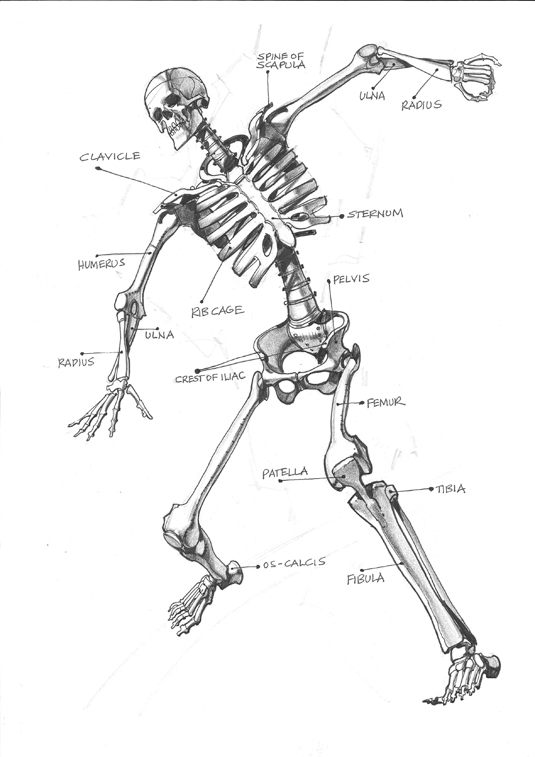 In particular, look at how the rib cage and pelvis can be reconsidered to suit the scene. This is a diagram of the life that’s present in the life drawings of Tarzan. 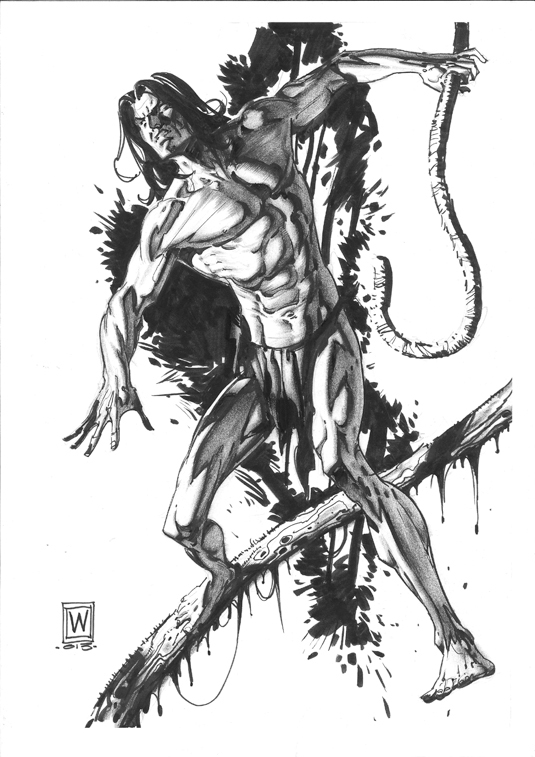 If you think in these terms as you’re drawing Tarzan then you’ll preserve the vitality of the rendering. 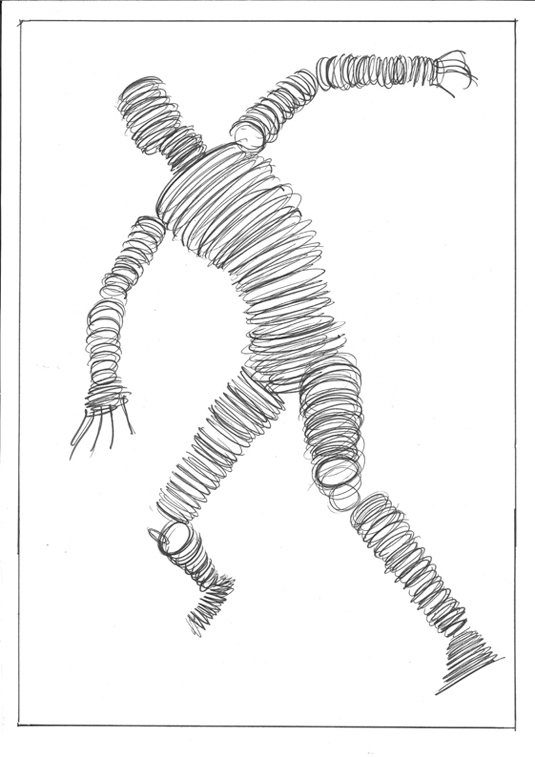 I call this method the Slinky Man Rendition, for obvious reasons! It’s based on the geometric perspective of the previous stage. This is also a great loosening-up experience for drawing the human figure. After a while you’ll find that when you’re drawing from life, you’ll think of this expression in your mind while drawing what you see. Chiascuro means the drama of light and shadow in the picture plane. 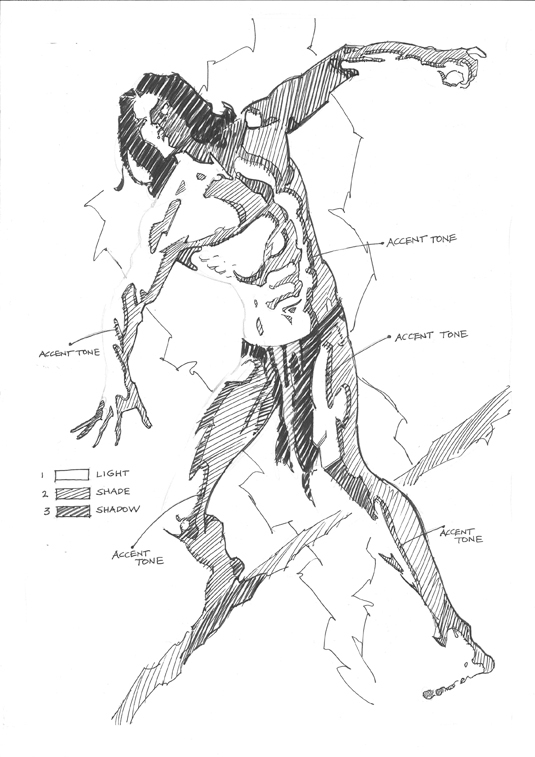 The rendition of Tarzan’s form can be reduced to three tones: light, shade, shadow, and an accent tone (refer to the diagram). Hopefully this piece speaks for itself. I’ve used all of the nine-stage principles to realise this finished Tarzan illustration. Note also how I’ve used the jungle vignette behind, suggesting the jungle but not too much so that it overwhelms the figure. Finishing this piece, I sketch in the figure and the background with a HB Staedtler pencil, then accent the shadow parts using a Tombo ABT NIS brush pen. For softening the tones into shade and shadow I complete the image with a Caran d’Ache black crayon.